The old faith-as-insurance-policy argument. Rather like the Chance card in Monopoly that lets you avoid jail, it offers you the chance to escape hell, where all this gnashing is supposed to occur, by the simple expedient of holding a particular set of beliefs in your head. Surely this hedging of bets doesn’t impress God, the supposed creator of the universe, Father of mankind and judge of all the Earth. He won’t really be taken in, will he, on that great and dreadful Judgement Day when we admit, ‘actually, I only believed in you so you wouldn’t send me to hell’? Maybe he will, being a God without discernment or insight. It’s certainly all that evangelical Christianity has to offer – just ask my preacher friends – a Get Out Of Hell Free card. Which is a long way from what Jesus taught about the coming Kingdom and how to be part of it; not, in his case, by believing the right things but by doing them (Matthew 25.31-36). What if I am wrong, though, as Christians think? Then I could be in trouble. But so might they; they could find they’ve gambled on entirely the wrong God (curse you Pascal for not thinking of that!) and find themselves up before Allah or Vishnu once they’ve miraculously survived death. 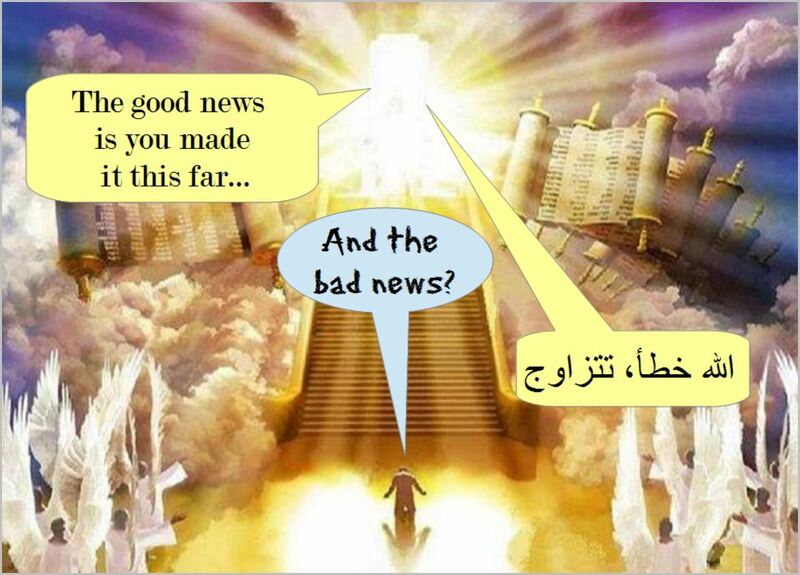 ‘Wrong God, mate,’ Allah will have to tell them: الله خطأ، تتزاوج . What then? And given that they think eternal life awaits them, why are so many Christians fearful of leaving this life? Could it be because they’re not convinced that the gamble is going to pay off? They know intuitively that this life is the only life they’ll be getting – and that when it’s gone it’s gone, as it says in Poundland. That will be why they mourn their brothers and sisters in Christ who ‘pass away’; “sorry to hear about your loss,” they say, when according to their magic betting slip it’s no loss at all but an immortal gain. There’s nothing on the other side – no judgement, no Heaven, no Hell, no eternal life – because there is no ‘other side’. If any of you would like to demonstrate that these assertions are wrong, please do. All I ask is that you bear in mind that insisting they’ll happen at some point in the future because the Bible says so, is not evidence; it’s wishful thinking. Which is pretty much where we came in. This entry was posted in 'Proof' of God, Atheism, Christian failure, Christian proselytising, Christianity's failure to deliver, Conversion, The impossibility of faith and tagged Atheism, Christianity, Christians, false promises, Heaven, Jesus, Kingdom of God, Resurrection, the end is nigh by Neil. Bookmark the permalink. The thing that always got me about pascal’s Wager was the premise that what i believe could be viewed as a choice. There is always something in belief which escapes my own will. Interesting point, Daniel. Do we indeed have anything that can be called ‘will’? I doubt we have ‘free-will’, at any rate.